While the Leica M is comparatively compact compared to most of its SLR competition, the lenses are not as compact as they used to be. 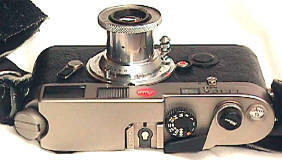 The solution for ultimate Leica M compactness? Use the old lenses! Titanium M6 shown with a classic collapsible 50/3.5 coated Elmar lens from the 1950's, in collapsed and extended position. 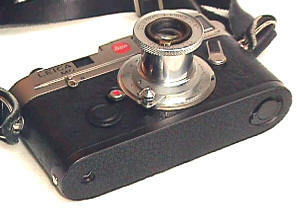 Retracted into the body, there is not a more compact 50 to be found for Leica. 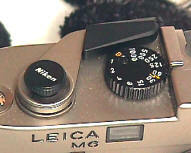 For Leica newcomers, older Leica screw mount lenses are used on the newer M cameras with a Leitz bayonet adapter, with full RF coupling. The regular Titanium shutter speed dial is a little bit hard to read, being black lettering on a Titanium dial. Replacing it with a black dial makes for easier use. The superb Leica shutter release is made even a bit more superb (OK, so I did make up the word) by the addition of the Nikon soft release made for the Nikon 6006. A black baseplate on a Titanium? Yep. M baseplates are EASILY scratched, much reducing the camera value. the mint Titanium baseplate was replaced with a not so mint black user baseplate. Personally, I think it looks better with this combination anyway. 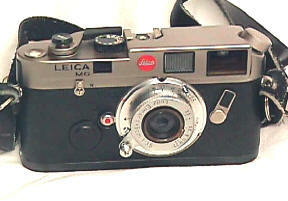 The ample wide leather strap and leather inserts prevent the 25 cent strap ring from scratching the $2000 camera body. See that funny looking rubberized stuff on the bottom of the camera? That's an insurance policy! Go down to your local hardware store, and ask for non skid material to put on stairs. Two kinds, one that looks like sandpaper that you don't want, and nice rubberized stuff that comes in rolls and different colors with adhesive on the back of it. 1) Cut out a section LARGER than your baseplate 2) Remove the adhesive and LIGHTLY stick the rubberized stuff to your baseplate 3) REMOVE the rubberized stuff, and you will see a faint outline of your baseplate on the adhesive 4) Use a straight edge razor blade to cut out the two sections covering the tripod socket and the base release 5) Put the stuff back on the baseplate, carefully aligning up the opening catch and tripod holes 6) Firmly press the baseplate and covering together 7) Now attach the baseplate and place the camera baseplate down on a thick piece of cardboard, or your mother-in-law's favorite dinner table. Use the straight edge razor blade to cut around the outside edges of the baseplate to finish the job. 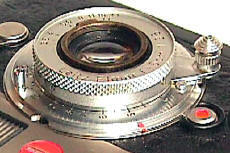 Now some Leica marketing dream out there is whining "older lenses are not as sharp as the new lenses." Well that is true, but are you really stupid enough to think that will make any real world difference? During the 50's the likes of Eugene Smith, Cartier-Bresson, David Douglas Duncan, Capa, and Eisenstadt set the standard for candid Leica photography with lenses often seen today as old and substandard. Yet, today's photography certainly is no better, and is very seldom as good. If any of you self imagined Leica marketing dreams, that deserve only the newest best sharpest and most expensive lenses for your own snapshots and photo club competitions, EVER are seriously compared to the best by knowledgeable photography critics, be sure and let me know. I can always use a good laugh. Until then, count yourself lucky if you ever begin to remotely approach what that supposedly "outdated old and substandard" 50/3.5 collapsible Elmar can give you. As much as I like the 50/3.5 Elmar's ultimate compactness combined with the M6, it is not included in my current choice of a compact M outfit. For a small, compact, lightweight M6 outfit, I am currently using a 15/4.5 Voigtlander Heliar, 35/2 Summicron, and 90/2.8 Tele-Elmarit. It's a nice combination, with each lens offering a substantially different point of view than the others. I make no claim of this being the "best" compact M outfit. The truth is, the ultimate outfit is always the one with you and loaded with film (not home in your closet).